PG&E delivers some of the nation’s cleanest energy. In fact, the carbon dioxide emissions rate from our delivered electricity is about two-thirds cleaner than the national utility average. Moving forward, we stand ready to do our part to meet California’s ambitious clean energy goals, which we believe are bold, and with the right structures in place, attainable. PG&E strongly supports California’s clean energy goals. California has one of the highest renewable energy mandates in the nation, and benefits from a “loading order” to prioritize energy efficiency and renewable energy in meeting customer demand. In October 2015, California’s Governor signed Senate Bill (SB) 350, which increases the state’s Renewables Portfolio Standard (RPS) to 50 percent by 2030 and doubles state energy efficiency goals. The bill supports the Governor’s April 2015 Executive Order, which set a new goal to reduce greenhouse gas emissions by 40 percent below 1990 levels by 2030. PG&E fully supported SB 350 as an important step toward achieving California’s aggressive climate change and clean energy goals. PG&E has made significant contributions to the state’s progress and is well on our way to meeting California’s renewable energy target of 33 percent by the end of 2020 ahead of schedule. PG&E appreciates the flexibility the new law provides on banking of excess renewable energy procurement, which will provide for greater opportunities to secure the best renewable energy pricing available on the market for our customers. PG&E also supported the bill’s challenging targets on energy efficiency and will use our full array of tools and programs to help achieve those goals. PG&E also appreciated the bill’s authors for recognizing the importance of advancing discussions around electric vehicles (EVs). PG&E is committed to ongoing leadership on energy efficiency, support for rooftop solar, investments in smarter energy infrastructure and helping to enable the broader adoption of EVs. We believe the path to achieving the state’s long-range environmental goals, while continuing to grow California’s economy, is through an integrated and flexible approach to achieve sustainable and future greenhouse gas emissions reductions in a way that manages costs for customers, ensures electric reliability and gas safety, and creates a model program for others to follow. 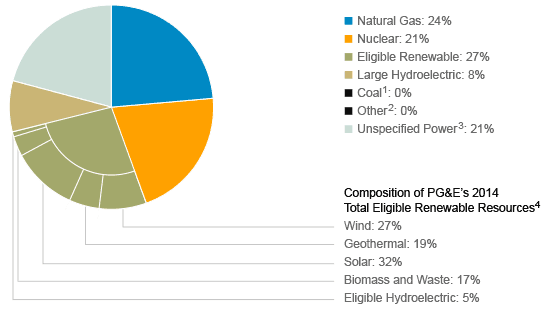 By the end of 2014, 27 percent of the electricity we delivered to our customers came from eligible renewable resources. The chart below shows our overall electricity supply mix for 2014, which included both the energy PG&E generated and the energy PG&E purchased from third parties. * “Other” includes diesel oil and petroleum coke (a waste byproduct of oil refining). “Unspecified Power“ refers to electricity generated that is not traceable to specific generation sources by any auditable contract trail. ** As defined in Senate Bill 1078, which created California’s Renewable Portfolio Standard, an eligible renewable resource includes geothermal facilities, hydroelectric facilities with a capacity rating of 30 MW or less, biomass, selected municipal solid waste facilities, solar facilities and wind facilities. These figures are preliminary and will not be finalized until verified by the California Energy Commission. 1 Refers to electricity generated under contracts with third-parties. 2 Includes diesel oil and petroleum coke (a waste byproduct of oil refining). 3 Refers to electricity generated that is not traceable to specific generation sources by any auditable contract trail. 4 As defined in Senate Bill 1078, which created California’s Renewable Portfolio Standard, an eligible renewable resource includes geothermal facilities, hydroelectric facilities with a capacity rating of 30 MW or less, biomass, selected municipal solid waste facilities, solar facilities and wind facilities. These figures are preliminary and will not be finalized until verified by the California Energy Commission. PG&E will continue to rely on a wide variety of clean sources of power, including nuclear, solar, wind and hydro, to provide electricity for our customers. Once approved by regulators, PG&E plans to make its Community Solar Choice program available to all bundled electric customers, offering them a choice to support 100 percent green energy from new small and midsize solar projects located in PG&E’s service area. As we move to a smarter grid that integrates more renewable energy sources, the interest in energy storage technologies is growing, whether in the form of batteries or other devices. This growth is driven, in part, by California’s energy storage target, which requires electric utilities to purchase 1,325 MW of storage capacity by 2020. Energy storage may be able to fulfill some of the increased need for operating flexibility; however, it is too early to tell whether and for which applications additional amounts of storage could be cost-effective. Accordingly, PG&E is exploring emerging storage technologies through a variety of pilot projects. PG&E has deployed two battery storage systems to test the operational capabilities of energy storage on the electric grid: a 2-MW system at PG&E’s Vaca Dixon substation and a 4-MW system at a customer site in San Jose. These pilots aim to provide critical real-world data on the technical and financial performance of battery energy storage to inform future decisions about how these assets can serve PG&E’s customers. PG&E is also conducting a feasibility study to demonstrate the viability of advanced, underground compressed air energy storage technology. As envisioned, the project would store large amounts of energy from resources such as intermittent renewable energy that may be generated at times when it is not needed by our customers; this excess energy would be used to power large compressors to store the energy as high-pressure air in an underground reservoir. The air would then be withdrawn to power an industrial turbine-generator set to produce electricity when demand is highest. As new technologies emerge, policies should allow California to do what it does best: innovate. PG&E believes future greenhouse gas policy should encourage cross-sector reductions and recognize that not all sectors and businesses are starting from the same point. A framework that enables PG&E to make the right choices for our customers and operations will ensure that the company achieves the necessary reductions in the most affordable and sustainable manner. There is much that still needs to be done, but PG&E believes that by working together, we can all build a better California and help lead the nation and the world into a cleaner energy future.